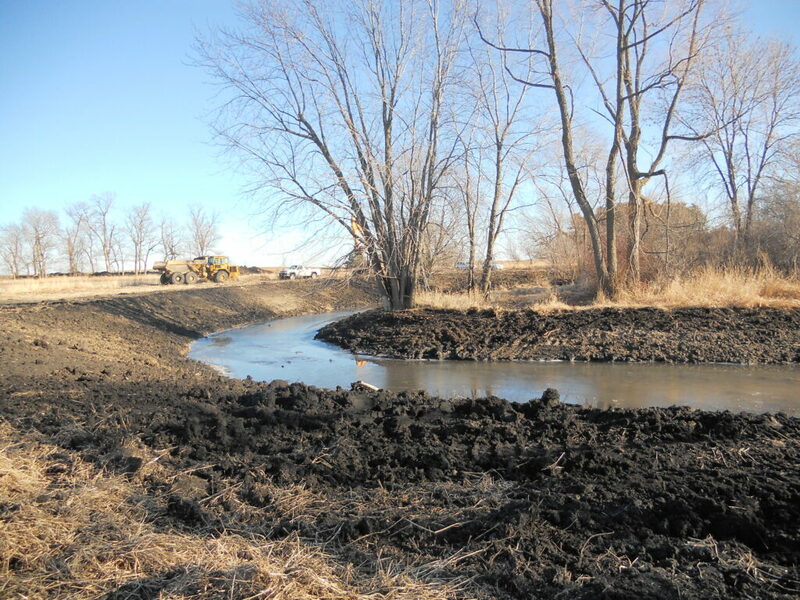 An oxbow is an abandoned stream meander which provides valuable ecosystem services including wildlife habitat, flood water storage, and nutrient processing. A multi-purpose oxbow is designed with the intent of being shallow enough to remove nitrogen, but deep enough to ensure that fish species can over-winter in its pool. Restored mult-purpose oxbow, image courtesy of IA TNC. Multi-purpose oxbows are located near a stream and generally are in marginal land that is not in crop production. They need to be paired with the discharge of a tile line to remove a significant amount of nitrogen as oxbows depending on flood-pulses often do not have enough of a source of nitrogen to remove a significant amount. The oxbows need to be in the floodplain in order to connect to the stream on a 1 to 2 year interval. Connecting to the stream allows fish to move in and out of the oxbow. The multi-purpose oxbows are sized based on the size of the historic oxbow. To maximize nitrate reduction the pool size should follow the recommendations of 1-2% pool to drainage area that constructed wetlands follow. To minimize predatory fish presence, oxbow pools larger than 0.5 acres should be broken into smaller cells. Nitrate loads reductions of 42% have been recorded with multi-purpose oxbows. The larger the pool area compared to the drainage area generally leads to higher performance.